While I was planning for the 2016 Public Library Association Conference in Denver, Colorado, one thing became clear: it was going to be difficult to take in everything I wanted to in four days. As I reviewed the conference sessions, I found myself highlighting many more than I could possibly attend — with so many great sessions, how would I choose? 1. Makerspaces Big and Small — We Love Them All! As national and state interest and funding for STEAM programs has grown, librarians have focused their vision on being the source and inspiration for science, technology, engineering, art, and math learning, and makerspaces are a natural extension of this philosophy. Over the past few years, makerspaces have grown from a unique concept to a must-have in many libraries. Almost every attendee I talked to was interested in creating or expanding a makerspace in his or her library, whether it be revamping the library layout to accommodate a dedicated makerspace or finding a unique mobile solution for a smaller library. In the session, “Think Outside the Box by Going Inside the Box,” Raleigh Ocampo from Oak Park Public Library (IL) shared how they took a museum approach to their programming with monthly exhibits that prompted library users to interact with them. Check out their flickr page to view some of the rotating programs. In the same session, Amy Holcomb shared how Skokie Public Library (IL) is promoting STEAM concepts through the BOOMbox, rotating equipment-based and concept-based programs for all age groups. In its first year, the BOOMbox saw over 3,000 visits. Read Skokie’s Year in Review for a full description of their experience-based programs. Time and again I heard the message that to truly serve a community, library leaders and staff must seek to understand the everyday lives of the people in it, including not only their interests, but their needs and challenges. During their session, “Extraordinarily Engaged: How Three Libraries are Transforming Their Communities,” Amber Williams, Erica Freudenberger, Cindy Fesemyer, Sarah Ostman and Patrick Roewe, participants in ALA’s Libraries Transforming Communities Initiative, shared exemplary cases of community engagement that all centered around the same message: The library can become a change agent when librarians actively listen to community members. Through in-depth conversations and interviews with library staff, patrons and non-patrons, volunteers, educators, service organizations and municipal leaders, these libraries were able to create a culture of inclusion and tailor their services to the interests of their community members. Action items included going out to places where people are, such as schools, health organizations and laundromats, rather than waiting for people to come to the library. The key was to stop thinking of the library as a place, but rather as an entity that can meet its community members where they are. “Take the show on the road,” recommended Patrick Roewe, Deputy Director of Spokane County Library District (WA). “What if you did afterschool programs at afterschool programs?” Other ideas included hosting concerts in city parks, partnering with local businesses to create a city-wide literacy festival, holding storytimes at local businesses, bringing engaging activities to community events, and providing a lending library at the local food bank. Throughout the conference, I heard outstanding examples of library programs and partnerships that provided invaluable learning opportunities for their communities. Clearly libraries are institutions where learning happens, and Valerie Gross, president and CEO of Howard County Library System (MD), is taking it a step further and advocating for changing the language we use when we talk about libraries and their services. Gross cited a 2013 Pew Report that stated 33% of Americans don’t know what services are available at public libraries. Proving her point that Americans aren’t connecting libraries with education, Gross asked the audience what percentage of Americans know what services schools provide — the answer was 100%. Hence the need to reclaim the title of educational institution and to rename our programs as educational services, said Gross, because words have power. To receive the same funding and the same perceived value as America’s educational institutions, librarians must lead the change in the language that is used to describe libraries and their services. Storytimes become early literacy classes; programming becomes classes, workshops and events. It is up to the librarians and administrators to advocate for their institutions, in part by using strategic vocabulary with the public and elected officials, said Gross. This change will be reflected in the public’s perceived value of the library, and, ultimately, affect the support and funding libraries receive. Multiple library leaders, including Diane Banks from Toronto Public Library (ON), where one of the three service pillars is Literacy & Learning, echoed this sentiment. “We’re providing a place that values critical thinking and collaboration. The formal education system is where they’re taught. But we want our staff to see themselves as educators,” said Banks. Partnerships built through outreach are mutually beneficial; for example, outreach to schools bolsters both the library’s and the school’s mission. “Starting at grade 4, a love of reading starts to decline dramatically,” said Banks. Enter the public library. Working with schools to promote the program, the Toronto Public Library produced a “super sleuth” print package directed specifically at 4th graders to provide a fun way to bring them into the library and expose them to everything the library has to offer. The result — 86% of area 4th grade students now have a library card. The Toronto Library’s Leading to Read program provides volunteer tutors once a week for an hour. Working in tandem with the school system, outcomes were assessed, with significant changes in attitudes toward reading and a major increase in reading proficiency. Building services for groups beyond school age requires some research and creative partnerships. The panel hosting “Emerging Adults: Who Are They and How Do We Find Them?” recommended first reviewing the census data and figuring out what a group’s living situations might be to understand how the library can accommodate them. This might include partnerships with homeless shelters, drug and alcohol addiction services, mental health services, health organizations, etc. First steps in creating productive community partnerships include meeting, talking, listening and figuring out how to share resources to create partnerships. Can you bring a coloring program to a local homeless shelter? Set up a lending station in a laundromat? Partner with a local employment organization to hold a job fair in the library? Help facilitate summer camp opportunities for at-risk youth? These are just some of the many ideas shared at PLA 2016; it was clear from the energy felt at the event that libraries are more relevant than ever and that librarians have the power to transform — not only their institutions but also their communities. As Valerie Gross from Howard County said, “You are all leaders in the library world; you already do great things.” And with so many interesting new theories and opportunities to explore, there’s no telling where you’re going to take your library next—imagine the possibilities. 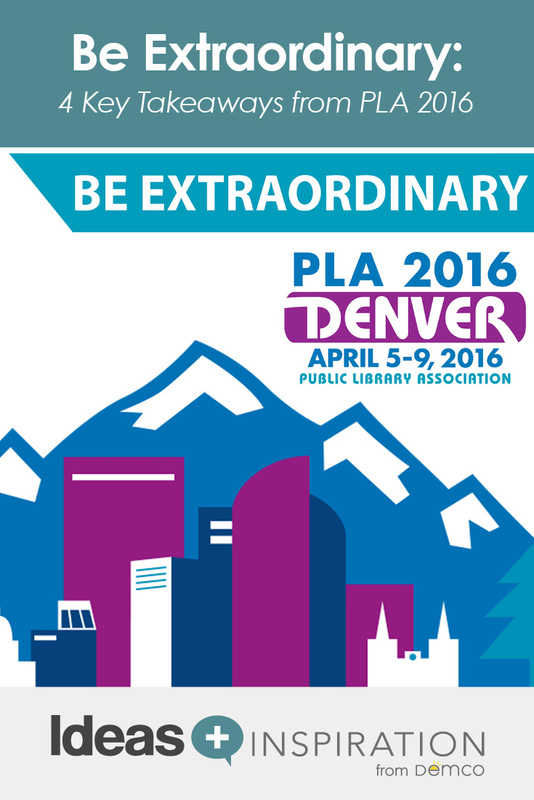 We’d love to hear what sessions resonated with you, as well as your takeaways from PLA 2016. Share with us in the comments below or on Twitter.